It’s long been known that the secret to a pleasing appearance is symmetry, and that’s a point proved by this large scale vinyl shed. Perfectly square with a width and depth in excess of ten feet each, it offers a lot of storage potential. This is helped still further by the tall ridge and eaves height provided by the apex roof. Water simply bounces off of the roof and off of the cladding itself. The overlap styling makes it very difficult for water to get inside, whatever angle it’s blown in at. This means you can be confident that your contents will stay dry and protected from the elements for years to come, which is also shown by the confident 10 year warranty provided by the manufacturer. 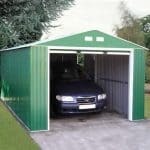 If you’ve never had a plastic shed before, don’t let the thought of an artificial appearance put you off. In fact, we found this to be a good looking garden building that combines traditional rustic styling with a modern substrate. PVC cladding offers many advantages: it won’t rot, it won’t rust, and you’ll never need to treat or paint it. For these reasons it’s an excellent choice for people who want to install a shed, and then never have to worry about it again. It’s almost impossible not to be struck by this large plastic apex shed’s appearance, and yet in no way does it look ugly or obtrusive. The ivory colour is neither too bright nor of a shade that will attract dirt, and we feel that it will complement a garden environment, particularly near homes that already have PVC fascias, soffits, or conservatories. One quality that PVC automatically enjoys is excellent resistance to rainwater, and this is enhanced further by the tall apex roof that simply carries water away. The ridge height of this shed is 2.16m and the eaves height is 1.85m, both of which are greater than those on many garden sheds we review. When choosing a site upon which to base it, you’ll need to take account of the overall width and depth, which are 3.18m each. The frame is very important on plastic sheds, as it brings stability. That’s why we were pleased to see that this shed used strong and relatively thick steel for the frame and supports. The PVC cladding that sits on top of it was thin and lightweight, as we expected, but the combined effect is a shed that looks and feels tough and rigid. Unlike traditional timber garden buildings, this PVC shed comes without a floor. 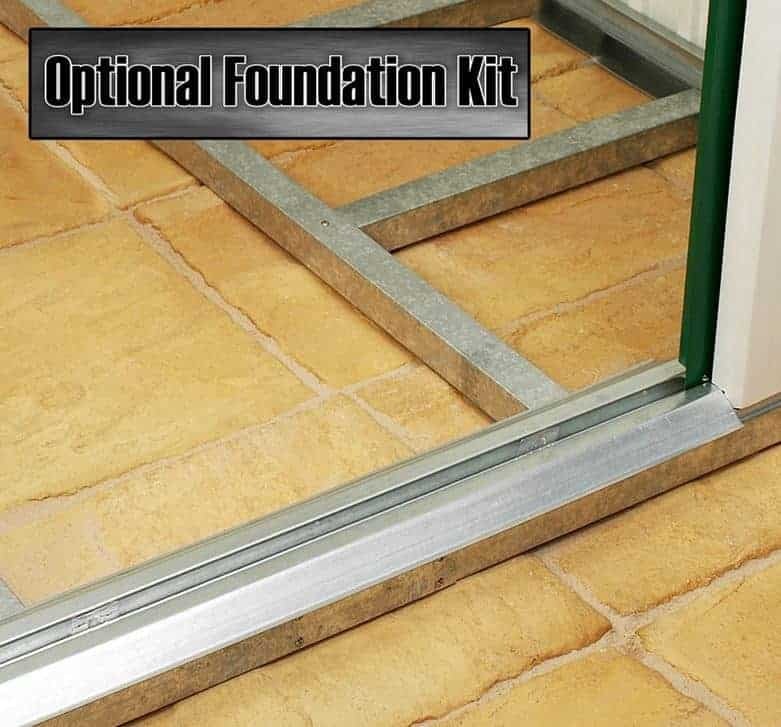 That’s because it’s designed to fit directly onto a pre-existing area of concrete, and it’s important to note that the area must be completely level, so you’ll need to check that with a spirit level. We were disappointed that an anchor kit wasn’t included with a shed of this price, so this essential item will have to be purchased as an optional extra. If you’ve owned a wooden shed before you’ll know how much time and money it can take adding coats of preservative every year, and even metal sheds can be prone to rust over time. PVC sheds like this will never need painting or preserving, and they can’t rot or rust. For these reasons, we feel that they’re perfect for senior citizens or people with mobility difficulties. 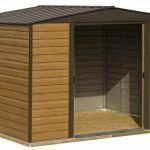 The manufacturer has supplied a 10 year warranty, but we wouldn’t be surprised to see this shed last much longer without any problems occurring. We often review relatively large sheds that are let down a little by small and narrow doorways, but that certainly wasn’t the case here. The double doors open to a width of 1.52m, which is much wider than most double doors we see, and they have a height of 1.81m. Taller shed owners especially will appreciate not having to stoop to walk through the door, and this also makes the transporting of goods much easier. There is no window included as standard, although we were pleased to find that one can be added as an extra at the time the shed is purchased. With added privacy comes added security, for the simple reason that if a thief has no way of knowing whether anything of value is kept inside a shed it’s much less likely that they’ll target it. That’s why feel the window free design can add significant security benefits. One area where security could, and we feel should, be improved is with the inclusion of a padlock. The doors are padlockable, but the lock itself isn’t supplied. This is an essential purchase, especially as the doors themselves aren’t the strongest that we’ve seen. One optional extra that we really liked is the window set. 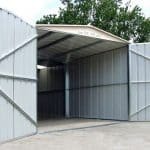 As mentioned above, the lack of windows can aid security, but adding one allows the shed to be used as a workshop, which given its size it is eminently suited for. The glazing in the window is acrylic, so although it’s clear it’s less likely to shatter on impact than glass. Fitting the window does require some cutting of the PVC, but this is easy to achieve. Another optional extra is a set of Hilti screws which can be used as an anchor kit. We would have preferred to see these included within the flat pack kit. 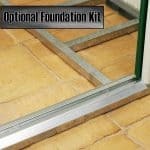 If you don’t have a pre-existing area of flat concrete, then the optional foundation kit helps you to build one quickly and easily. 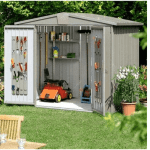 It’s obvious that great care and attention has been given to the quality of this shed, as exemplified by the strong steel used for the frame. The 10 year warranty provided by Duramax shows how highly they rate this shed, but it could last much longer thanks to its long lasting PVC. This is the largest plastic shed that Duramax make, and thanks to its tall eaves you can fit even more inside than you might at first think. We would recommend adding a shelving or racking unit, available as an optional extra, to take advantage of the vertical space available. 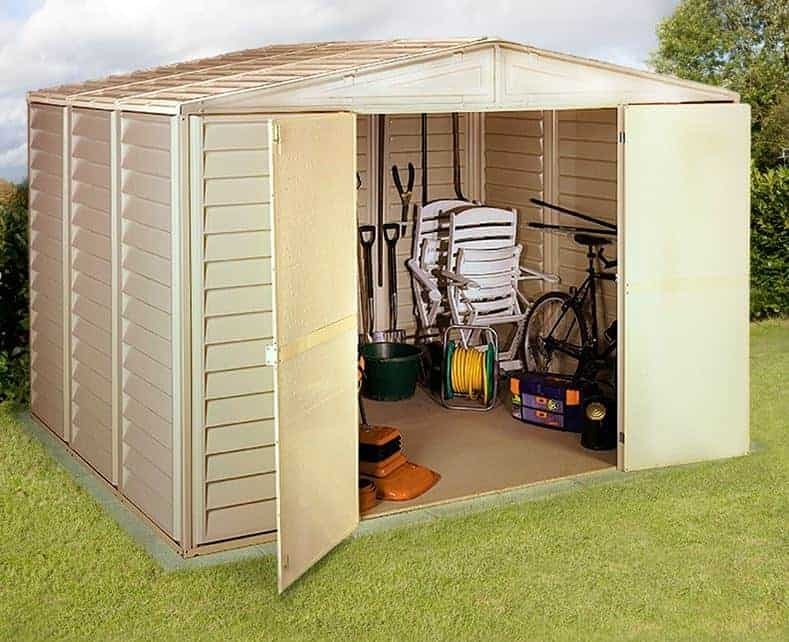 Simply because of it’s size, it can take you and a friend around four to five hours to install this shed. We were pleased, however, to find the assembly instructions clear and easy to follow. As long as you don’t want a traditional timber shed, this garden building is hard to beat when it comes to value for money. The only slight downside is that neither a padlock nor anchor kit was included, but these can be inexpensive additions. Final Thoughts: If durability is especially important to you when choosing a shed, then you won’t be disappointed if you purchase one made of PVC. 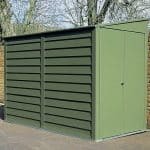 This one scores particularly highly in our opinion, as although it provides all of the benefits associated with plastic sheds, it still looks attractive and is styled upon the rustic sheds that have graced gardens for decades. Because of its size, which we were pleased to see backed up by a tall eaves and doorway as this isn’t always the case, we can imagine people spending a lot of time inside. The addition of the optional window creates an even more pleasant environment, and means this shed can double as a workshop.